OLG enrolls students in kindergarten through 8th grade with an enrollment of 653 students for 2017-18. Class sizes in K-5 range between 19-29 students, with each elementary classroom assigned a teaching assistant to work with the students for half of each day. Middle school classes typically average between 20-25 students. Approximately 10% of our students identify as Hispanic or students of color. The majority of OLG students reside in Edina, but OLG students come from over 25 different cities including Bloomington, Eden Prairie, Minneapolis, and St. Louis Park. The majority of families who enroll their children at OLG are Catholic and there is a percentage of our students who identify themselves as non-Catholic. All are welcome to attend OLG! Each year, our students excel in their spring Minnesota Comprehensive Assessment (MCA) and Measures of Academic Progress (MAP) assessments. Our students almost always score in the top one or two percent in both MN and the nation in reading and math. OLG has received the National Blue Ribbon School of Excellence award from the U.S. Department of Education in 2009 and 2001, and is one of fewer than 10 schools in Minnesota who have received multiple Blue Ribbons. Our curriculum is aligned to state and national standards and K-5 curriculum includes Houghton Mifﬂin for language arts, Everyday Math, Sadlier for religion, Project Lead the Way (STEM) and Foss for science, and Studies Weekly for social studies. Beyond their religion classes and weekly liturgy, our students have the opportunity to both grow in their faith and put their faith to action. 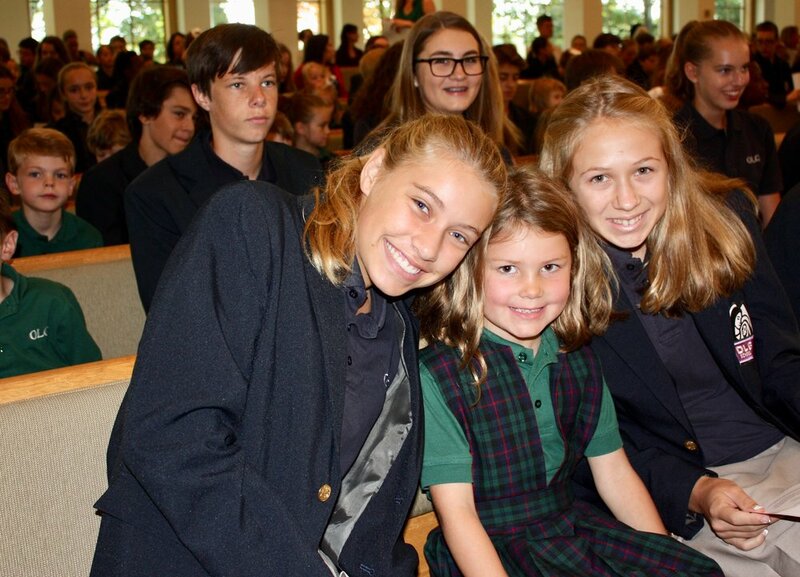 Most grade levels become prayer buddies with another grade level and together participate in special events, service projects and sit together at liturgies. Each month, we have a school-wide service project led by a different group or grade levels within the school. Middle School students can participate in Middle School Service Club, become an altar server, serve meals at Sharing and Caring Hands and serve as a Peer Minister to the school in 8th grade. There are 40 members on our professional staff, 90% of whom have a master’s or other graduate degree or have studied beyond the bachelor’s level. Additionally, we employ 9 full-time teaching assistants, most of whom are licensed teachers. Students and families have access to a K-8 Counselor, a School Psychologist, a K-4 Learning Specialist, a 5-8 Learning Specialist, small group Orton-Gillingham reading support, on-site special education services and a K-8 health associate. Our One-to-One Learning program for Middle School is award-winning. Each K-2 classroom has a cart of iPads, and 3rd-5th grade classrooms have a cart of Chromebooks. Middle School students carry a MacBook Air with them to each class. Our teachers creatively use technology resources to increase the educational opportunities for all our students. OLG has a variety of extra-curricular activities available in grades K-8. Some of the most popular activities include grade-level choirs, band, math team, Destination Imagination, Lego Robotics, and chess club. OLG is a member of the South Side Youth Organization, in which the OLG Saints teams participate in volleyball, soccer, basketball, baseball, softball, and run club mostly in grades 5-8. Our school day runs from 8:35 a.m. until 3:15 p.m. We offer an Extended Care Program that is available starting at 7:00 a.m. and until 6:00 p.m., as well as during most school vacation days and the summer. Because of the exemplary faith and academic preparation they receive, our graduates experience success at local Catholic and public high schools including, among others: Academy of Holy Angels, Benilde-St. Margaret’s School, Convent of the Visitation, St. Thomas Academy, and Edina High School.